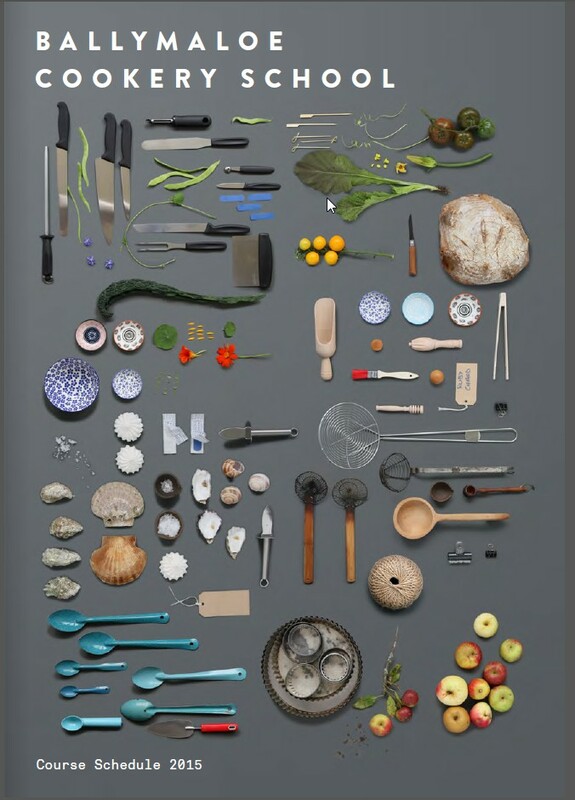 In 2014, Ballymaloe Cookery School engaged TrueOutput, a design company based in Waterford City, to collaborate on the re-design of the cookery school brochure for that coming year. We wanted our new look to reflect the ethos of the school - a place of education, true to its founding principles of sustainability and traditionalism, yet fostering a progressive, creative environment for its students . TrueOutput's initial design for 2015 was stylish and innovative, and garnered much praise and admiration from our students, customers and fans alike. The concept is based around taking an inventory of utensils, objects and ingredients students would encounter if they enrolled on a course. TrueOutput came to the school, styled and photographed a range of objects and produce in grouped scenarios. The use of a restrained utilitarian typography style echoed the recipes, kitchen lists and technical information found at the school. We are delighted to congratulate TrueOutput on winning the 2015 Irish Design Awards for this design (pictured above). Our 2016 brochure (pictured below) is a contemporary and elegant design, developing the original concept.